Storage units can be invaluable of you have too many belongings and not enough space to keep them in your home. However, their utility diminishes rapidly if they are not safe and secure. While storage facilities often have fences and gates that require a code, the best way to secure your own storage unit is with a lock. Which Lock Is Best For Your Storage Unit? Cylinder Locks – This type of lock is the same you would see on the doors to your home. They are flat against the door and require a key for entry. They are limited for use on storage units by their bulky nature but are very secure, as they can’t be cut. Keyless Locks – Odds are you saw plenty of these locks in high school hanging from the endless rows of lockers. Radial dials or numerical digits must form a certain combination to unlock a keyless lock. Unfortunately, these locks are easily cut and your combination can be figured out by outside means. One-Time Padlock – These locks serve a unique purpose, as they can only be opened by being cut, hence the name. The idea behind this type of lock is that you would be leaving your storage unit closed for an extended period of time. The only way to open this type of lock is to cut it, which, unfortunately, means that they can be cut rather easily. However, for they can also provide peace of mind that nobody will be accessing your storage unit while you are away. Closed Shackle Padlock ­ – This is a variation of the classic padlock that actually covers the u-shaped part of the lock that is susceptible to being cut. This provides an extra layer of security and makes this option a very cost-effective way to keep your belongings secure. Disc Locks – Not only are these locks very secure, but they come in a wide variety of sizes to fit just about any storage unit. Similar to the closed shackle padlock, disc locks are variations of a traditional padlock. They are round, like a disc, and are much more difficult to break into than a u-shaped padlock. Find the Right Storage Unit For You! 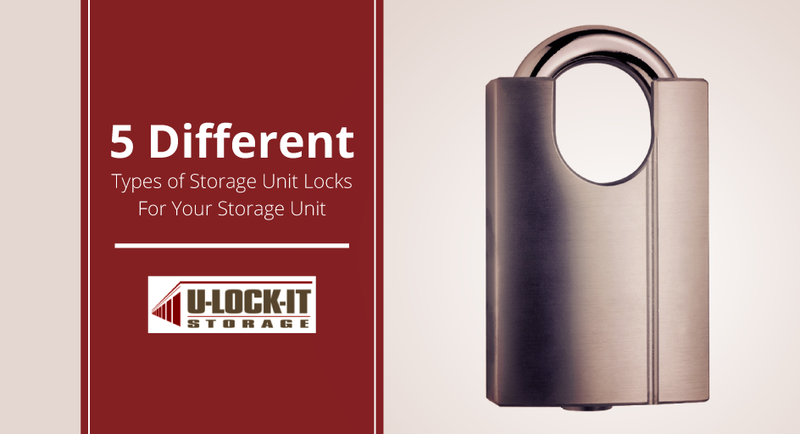 Choosing the right style of lock depends on how much you are willing to spend as well as the shape of your storage unit. U-Lock-It Storage in Madison, AL is ready to handle all of your storage needs. Call today!